Lowdown: An ordinary guy gets godly powers. Review: What if you, an ordinary person, were given god like powers? That's the question Absolutely Anything explores. Sort of, because it's a shallow comedy that doesn't really explore anything. A very British comedy. In order to set things up for answering this most philosophical of questions, we have aliens (voiced by the good old Monty Python crew), on their way to destroy the earth, give us one last chance. If an ordinary person (for some reason they pick on Neil, aka Simon Pegg) can be proven to use the god like ability they will give him to good use, then earth will be spared. As it happens, our Neil is a frustrated geek. He's having a hard time at work, loves his dog despite the hard times that dog brings on him, and got the hots for his hot neighbour Catherine (Kate Beckinsale, who, as I learned here, is a Brit). So guess what Neil is going to actually use the power to make everything he says come true for? Directed by Terry Jones, a Python himself, Absolutely Anything stands out for the talent it employs. Pythons and Peggs aside, the dog is voiced by a Robin Williams doing such a great job it makes his undue departure even worse to endure. And American comedian Rob Riggle does an excellent job playing out the Not Quiet American to the stereotype's letter. As for that philosophical question I have mentioned, the movie cops-out big time. Yes, we know that with great powers come great responsibilities, and we know it is easy to twist the best of intentions to get something nasty instead. 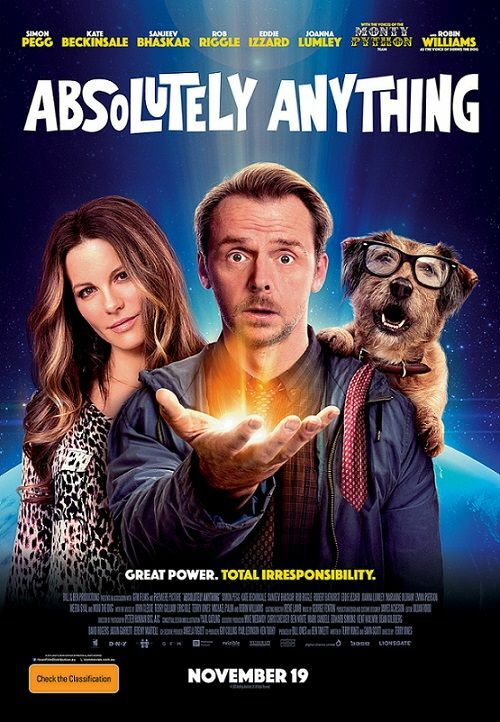 In order to justify its focus on the mundane romantic comedy, despite the vast scope at hand, Absolutely Anything plays the legalese care: everything Neil asks for is very literally implemented. Me, I'm sure any decent lawyer could have helped Neil solve this world's problems and easily so, but I'll let bygones be bygones and accept Absolutely Anything as the simple romantic comedy it is. Overall: A short dose of fun worth 3 out of 5 non godly crabs.